Sports picture books are a wonderful way to get your sports fans reading. So I went through the major sports and and created this best books for boys sports list instead. 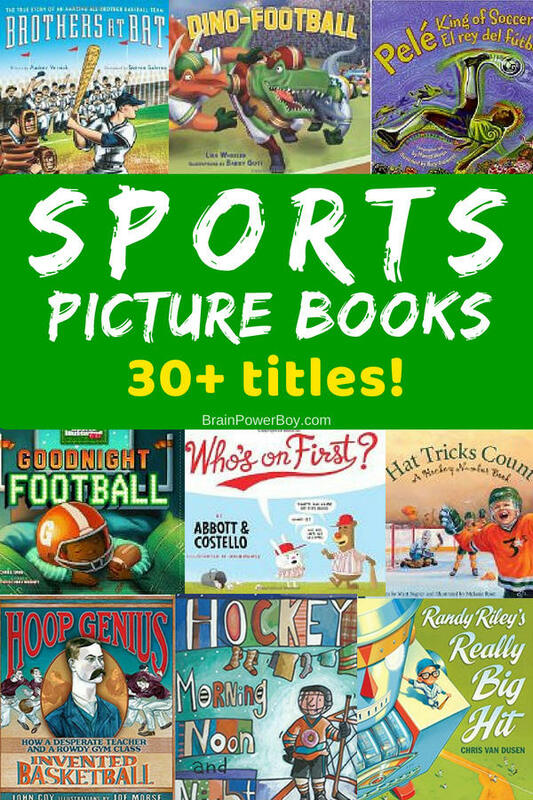 Be sure to see the sports picture books series at the bottom as well because there are some neat books on less common sports such as wresting, golf, and car racing, and extreme sports that I know some boys will really like. Go through the list and find your boy’s favorite sport. Then take a look at the titles and description to find the perfect books to read to him. Goodnight Football is a nice rhyming book about a boy who attends a evening football game and says goodnight to everything when they need to leave. They even get a goodnight moon in there 😉 A super choice for little football fans. This is a cute little father son title to try. Football With Dad shows a father and son sharing their love of football. See Also: Football Math Books That Score a Touchdown! Well, I had to slip a Curious George book in because, I just love him. Curious George at the Baseball Game As you can imagine, no baseball game is the same with George in the stands. A great book for showing that one’s talents matter even if they are not in the area of sports. In Randy Riley’s Really Big Hit Randy loves baseball, but he isn’t too good at it. Yet, he is really good at science. See how baseball and science come together in this neat story. p.s. there is a robot in there too! Try >>> Non-fiction Baseball Books That are a Grand Slam! I can’t wait to see Midnight Madness at the Zoo . It has hidden pictures, counting and the animal illustrations are great. Michael Jordan fans will enjoy Salt in His Shoes . Michael felt he was too short and because of this he couldn’t play well. He asked his mom how he could grow taller. This is written by his mother who was very supportive of his dreams. Ever wonder how the game of basketball was invented? Well, it was out of frustration! Read Hoop Genius for the details of a teacher who needed to find something for a group of bored and rowdy boys to do. If you are going to read about soccer, you might as well start with the all-time star. Pele, King of Soccer/Pele, El rey del futbol Painterly, flowing, swirling pictures illustrate this book that tells the story of a poor boy who goes on to be a soccer star. The book has both English and Spanish text. For more soccer titles, see the series books listed at the bottom of this post. Hockey Morning Noon and Night is a sweet look at a young boy’s obsession with hockey. He is all about hockey from morning to night. This is a counting book done Hockey-style. Numbers are everywhere and I like how they take the game of hockey and show this in a neat way. Hat Tricks Count: A Hockey Number Book is likely to get your boys noticing numbers wherever they go. First Hockey Words has the basic language of hockey. The team comprises of cute animals and words are defined through the pictures. Nicely done. Several of the books listed above for one of the sports are also available as other sports titles. There are currently three “Goodnight” books. Details are found in the football section above. Gail Gibbons’ Sports Books. Details are found in the basketball section above. The alphabet books by Brad Herzog (see football section above) come in football, baseball, soccer, golf, Olympics, car racing, and extreme sports. The Dino- Sports Books (see Dino-Football above) include hockey, football, soccer, basketball, baseball, wrestling, swimming and boarding. Whew! That is a lot of sports picture books for you all to take a look at. Hopefully you will find something wonderful to read to/with your boys. Need even more books? 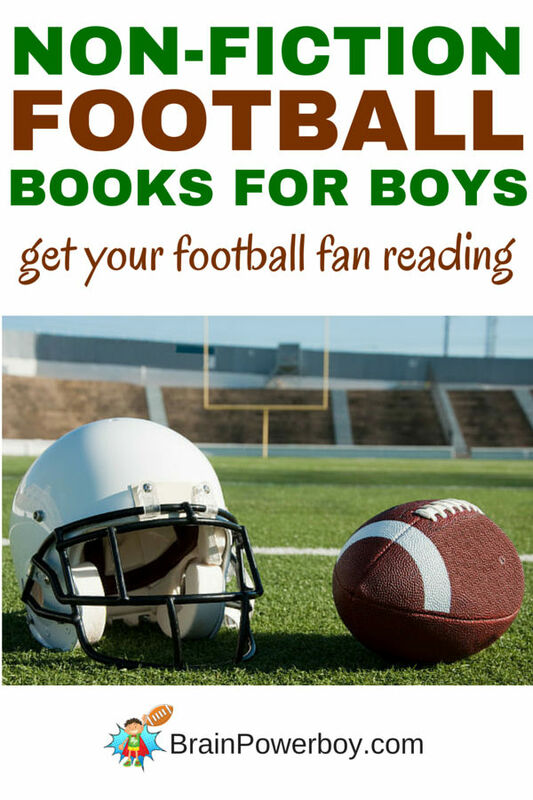 How about non-fiction football books for boys?! We love the DIno- sports series. They are pretty funny aren’t they, Mother of 3. They have quite the selection of sports in that series too. Something for everyone.